I don’t like Family Guy. You know that already. But it does, at times, manage to make me laugh. Other times it manages to insult me as a writer. With the episode “12 and a Half Angry Men,” it managed to upset me as a human being. Now this isn’t a matter of taking offense at an off-color joke. That happens too (seriously, Family Guy, I know you find sexual assault and domestic violence to be inherently hilarious, but is it too much for you to at least try to make a joke about these things instead of just putting them on display and assuming I find them inherently hilarious too?) but in this case it was more an example of problematic cynicism, and one that’s potentially damaging to our cultural mindset. The episode is about Mayor West being on trial for murder. The jurors all see it as an open and shut case, apart from Brian who holds out for a not guilty verdict. As might be expected he gradually sways the other jurors to his viewpoint and Mayor West goes free. Family Guy certainly wouldn’t be above suggesting that Mayor West actually did commit the crime, but I think it’s safe to say that, within the reality of the episode, he didn’t, and Brian and the others rendered a fair verdict. BRIAN: It was a pretty intense experience, but the important thing is that, in the end, justice was served. STEWIE: All you did was let a guy go. There’s still a murderer out there. BRIAN: Yeah but we saved an innocent man today. That’s something to feel good about. 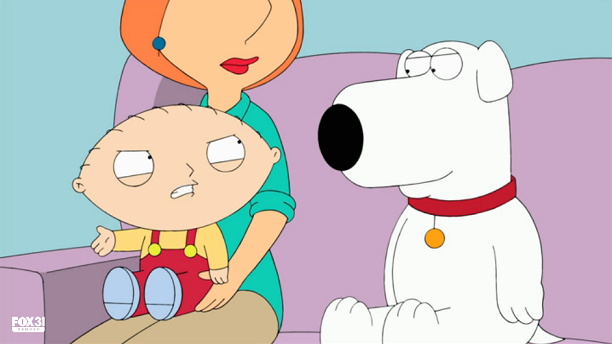 STEWIE: Feel good about? They found eight more bodies last night. One of them was on this block. There’s a maniac out there. He’s cutting people’s power off, breaking into their homes, and slitting their throats. Stewie continues his rant, and the episode illustrates, ultimately, that Stewie is correct. There is a murderer on the loose, and Brian shouldn’t be proud of what he accomplished. And here’s the thing: that mindset of Stewie’s, which is clearly endorsed by the episode, is a vastly destructive one. In this case, “Why did that happen?” refers to the deliberations being seen as a success, when, ultimately, the crime remained unsolved. See what’s wrong with that? Just typing it out gives it away: those are two different things. Related, sure, but separate. The deliberations are not the criminal investigation. The jurors do not and cannot catch the bad guy. That’s not their job. That’s not what they should be doing. It’s not “simply letting a guy go.” Conflating the role of a jury with the responsibility of cleaning up the streets is a bad thing. It’s not a clever insight, and it’s not a problem that someone takes pride in preventing an innocent man from going to jail. In cases like this — both real and fictional — there are two things at play. (I’m assuming here that a crime was actually committed, which isn’t always the case and can therefore complicate things even futher.) One: Someone committed a crime. Two: Someone is on trial for committing that crime. Those two things cannot be seen as the same thing. If you don’t understand the separation there, then you’re playing the wrong game. And that’s a problem. The jurors are responsible for item two…and not at all for item one. They don’t go searching for the criminal…they assess the testimony of the defendant. That’s all they do. Granted, I have some personal feelings on this subject. And maybe that’s why this felt so bothersome to me. But pull those out and you’re still left with a pretty clear logical conclusion: each group of people involved in this case has a job to do, and it’s the jury’s job to do theirs, only theirs, and to do it the right way. There should be a sense of pride associated with finding someone not guilty when there is not sufficient evidence of their guilt. Because that’s doing the right thing. That’s being human. That’s taking another man’s fate into your hands, and being responsible with it. Yes, if you find the man not guilty then that means there is still a criminal out there. But that’s not the issue the jury was assembled to address. We have a police force for that. The fact that you found a man not guilty does not mean you’ve let the world down and failed to do something constructive. You’ve prevented a potentially innocent man’s life from being ruined, or ended. Isn’t that about as constructive as one can get? Take Stewie’s concern to its (tellingly) unspoken conclusion. He harps on Brian because Brian did nothing but “let a guy go.” So it would have been better for Brian to not let him go? What then? Mayor West still didn’t commit the crime, which means the criminal would still be out there, racking up bodies. But it would somehow be seen as more constructive for a man to be imprisoned than not? Just so we’d have something to show for it? Stewie often serves as a voice-box for the writing staff. Part of his role as a character now is to point out these logical inconsistencies. But that’s a role that’s far too prone to cynicism, and it’s important to not let that drift too far along, lest you lose your humanity along the way. This isn’t an “inconsistency.” Brian didn’t “just let a guy go.” And nobody should feel unproductive for doing the right thing…even if that one right thing leaves another wrong thing unaddressed. I guess it’s easy to play with fate as long as it’s somebody else’s. But something tells me if a member of the show’s writing staff were on trial for a crime he didn’t commit, and he was found not guilty, he wouldn’t see that as a problematic inconsistency. More likely he’d be grateful that somebody did see to it that justice was served, and I truly doubt he’d be saying with his own voice what he already said here with Stewie’s. Because he’s one man, and the criminal is another. Their fates are not, and should never be, tethered together. If your cynicism is causing you to bind them up…then I think you’re long overdue for some serious soul searching. That’s not the world you live in. And you should be very happy about that. A great analysis, Philip. One that I agree with. Politically, I am very left leaning, and the early seasons of Family Guy, while about as subtle as a sledgehammer and prone to shock for shock’s sake, did do a good job in highlighting just how farcical society in general is when you look at it from a left-leaning point of view. But in recent seasons of Family Guy some of the political and social ideology has back flipped, and in fact does so within the one episode quite often, leaving a very confused mess that really doesn’t make any sense or make any rational point. Which is why I have stopped watching. I agree, excellent analysis. You also did a good job of spelling out just how I feel about Family Guy. The big difference between us is I don’t bother to put myself through watching the show at this point. Haha…yeah. Family Guy occupies a very fortunate time slot in our house…right between Bob’s Burgers and American Dad, both of which we watch pretty much every week. I don’t like that we have to sit through Family Guy (“have to” being used extremely loosely there) but I do find that the show has sunk to being instructively bad. It’s almost worth watching just to see how many things it does so incredibly poorly. Again, I don’t watch the show, but I think the situation you wrote about contrasts interestingly with the recent incident wherein Seth MacFarlane denounced a clip arranged from a recent Family Guy episode: Peter is seeing running over and killing people at the Boston Marathon and is proud of it, and then people are maimed by bombs. I’m to understand those clips were originally unrelated, but part of the same episode. I realize events like these can change how people view things like these, but it doesn’t seem like in hindsight MacFarlane regrets making jokes about murdering marathoners or terrorist bombings. I’ll laugh at most anything if it’s funny, but if his show aspires to be some sort of bold, cutting-edge comedy, it should own these sorts of decisions and not blame someone else for editing two clips from the same episode together. I was going to write a little piece about this incident, but what you’ve said here puts it better than I ever could. Thank you. If the writers had actually wanted to handle the thing properly, and discuss the fact that “there’s still a murderer out there” and not demonise Brian’s actions, Mayor West obviously should have been the guy to capture, or at least find the evidence that leads to the capture, of the murderer. Now, it needn’t have been some Batman-like quest to prove his innocence, he could have just run the guy down in his car on the way back from the courthouse, but his not-being-in-jail should have been what caught the criminal. The fact that they chose to go with the cynical, lazy gag (shock!) is very telling of their mindset. I have long since stopped watching Family Guy but if that’s the kind of thing they’re doing these days, I may have to start vocalising my disdain to others. Agreed, totally. In fact, I didn’t really get into it above, but I do think the “punchline” could have been salvaged by a good rewrite. Your idea works well, and I think you could have made a similar final joke if instead of fighting to turn the jury around, Brian just happened to be part of a jury in a case that found someone not guilty. No 12-Angry-Menning to be done…everyone knows he’s innocent, so deliberations last around one minute and they set him free. Then Brian starts trying to take too much credit for what he’s done, painting himself as this guy’s savior, or something, and Stewie calls him on that instead. Yes, he was part of a group of people that did the right thing, but he’s not the attention-deserving hero he’s making himself out to be. That would be a much better way to muddle the moral, I think. Instead the episode DID have him fight to save an innocent man from going to jail, and that IS something to be proud of…so what’s the joke? I’m not saying my idea would have made for a great episode or anything…but I am saying that what we got really didn’t have much thought invested in it, and that makes both the writer and the human being in me very sad. If the Noiseless Chatter byline is “Reading too deeply into things since 1981” then Family Guy’s would have to be “Not much thought invested in it since 2005”.